Thursday, June 26, 2014: 7:30 p.m.: Foraging California, with Christopher Nyerges: Christopher Nyerges, author of “Guide to Wild Foods,” will share the becoming of his latest published book, “Foraging California,” which is part of a nationwide series of foraging books. 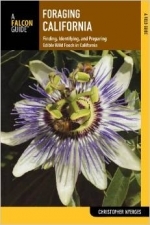 This book features edible California natives and non-natives growing in the wild from the ocean to the mountains to the desert and even your own backyard. Christopher will talk about the plants featured in the book, and explain how to use this book. He will share the joy and challenges of working with the publisher to convince them to change their pre-established format for the California foraging book in order to make this a better guide book for this subject matter. As far as we know, this is the first wild food book organized botanically, like the Jepson manual. For over 40 years, Christopher has been teaching people how to collect and use wild foods responsibly as a self-reliance survival skill. Gathering wild foods was also a way of life among California’s pre-Spanish population of native Californians. (However, foraging alone is not enough to ensure long-term survival or sustainability). Christopher will also talk about the traditional ways in which Native American’s “passive agriculture” over millennia turned California’s “wild” landscape into a virtual farm, without damaging the environment. Samples of common wild foods will be available for the audience to see and taste.